← Is it nearly the weekend? Well its the last day of the holidays, it is peeing down outside, so todays market was a complete washout. 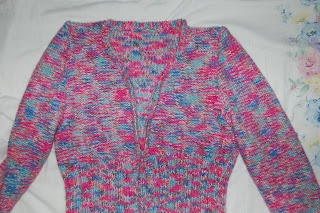 So my Eloise cardi is still buttonless as the haberdashery stall at the market was not there. 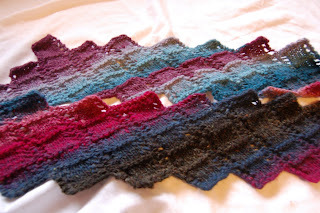 I am no further forward on the new project front, I have 2 sleeves and I want to knit some kind of collar/neck onto my Kepler, then and only then I will start something new, so please, no more temptation. Argosy 2 balls Kureyon colour number no idea but it should have orange in it but I don’t like orange so it hasn’t! 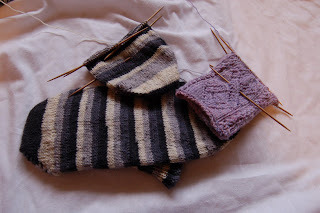 The lilac socks had to be frogged as I had made a mistake, it was the post-its fault! I finally finished my Dads green socks on the 2 circs, I won’t be doing that again in a hurry, not fun at all. He did like them and when I commented that he hadn’t worn them he said he was keeping them for good! I mentioned this to my brother, who owns a few pairs of socks now, as he nags more than most, he says he keeps his for good too, he also admitted to being scared to wash them, maybe I overdid it on the hand-washing lecture!! On the sewing front I sewed one pair of trousers yesterday to wear last night of course, we went to a local Asian restaurant, I ate lots of sushi, yummy yummy. I also prodded Jamie into sewing a bit of his quilt which is feeling a little abandoned and I took in a pair of jeans for Jordan, they weren’t quite drainpipe enough for Mr skinnymalinkylonglegs. More sewing this week as I want a new dress, though apparently we have visitors arriving on Thursday. I also want a new jacket but I ordered the pattern about 4 weeks ago and it has STILL not arrived, its going to be spring soon and then I won’t need it OR I won’t like it anymore……..
Hope you all had a good weekend, I spent a lot of mine food shopping for heavy items for a WHOLE month, we are having our lift replaced and it will be out of action for a month, 4 weeks of taking the stairs, carrying shopping, walking the dog, collecting the mail, so much fun and I know I should be taking the stairs anyway, its good exercise, I do live on the 7th floor though, do you know how many stairs that is? Me neither, I will let you know tomorrow……….